Every Halloween, Tom sets out to create an incredibly elaborate costume for Zack. I think it started when Zack was a toddler, and I would sew cute little costumes for him, like a “Zack in the Box” and a Munchkin. Secretly, or maybe not so secretly, Tom wanted to prove that he could make better costumes than me. But, that’s okay, because now Halloween is his problem and not mine. 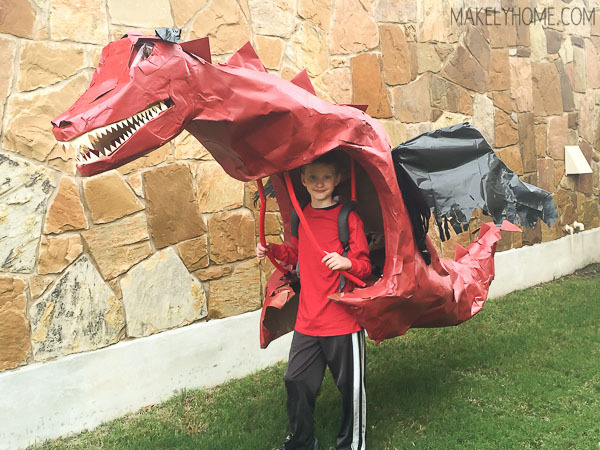 This year, Zack really wanted to be a dragon. If it were me, I would have hot glued some wings and spikes onto a hoodie and called it a day. But oh, no. In the Ballard household, things get quickly out of hand. 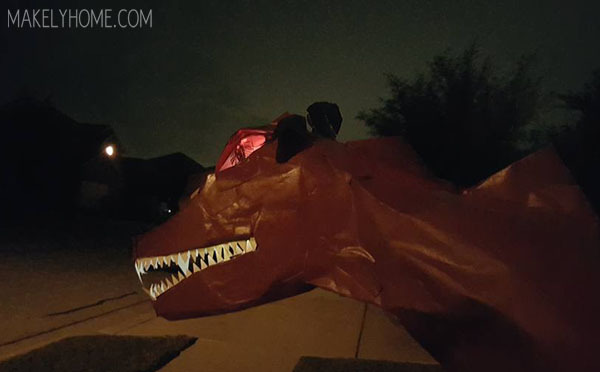 It’s hard to tell from this picture since it was taken in the daylight, but the dragon’s eyes light up red and the mouth glows white. There’s also a hidden Bluetooth speaker hidden inside the mouth that Tom could control from his phone and make it roar. Yes, it was absolutely ridiculous. 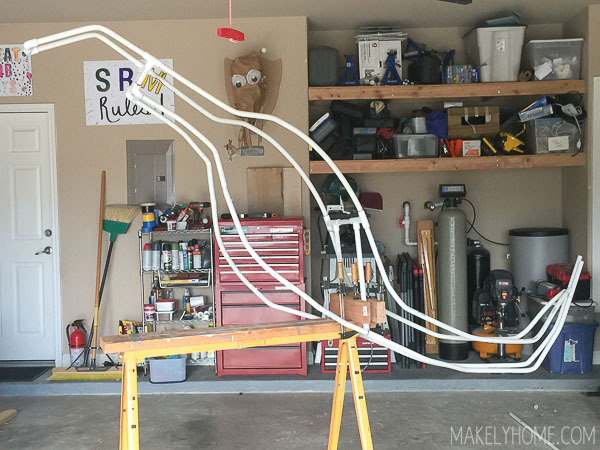 However, none of this could have been possible without the use of some of our favorite HomeRight tools in the garage. 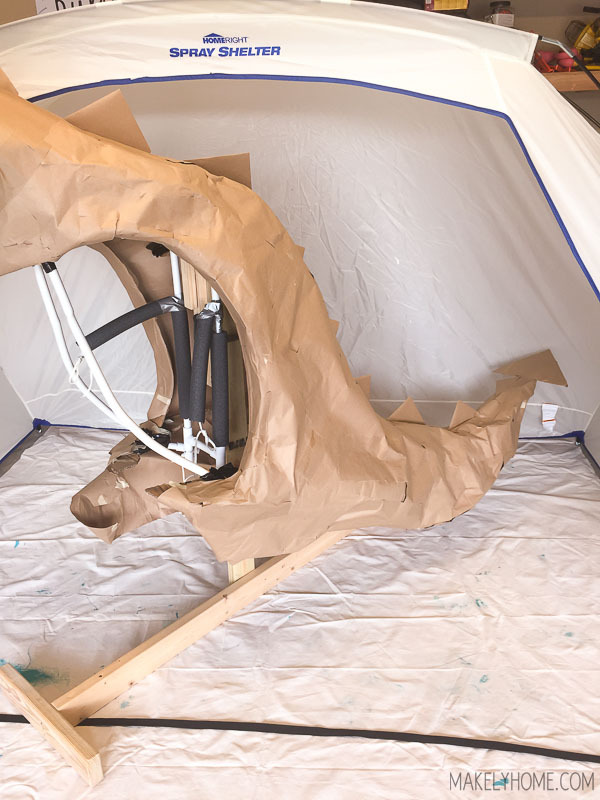 As I’ve previously written, Tom used the Dual Temperature Heat Gun (Amazon affiliate) to bend PVC pipes to make the internal frame of the dragon. 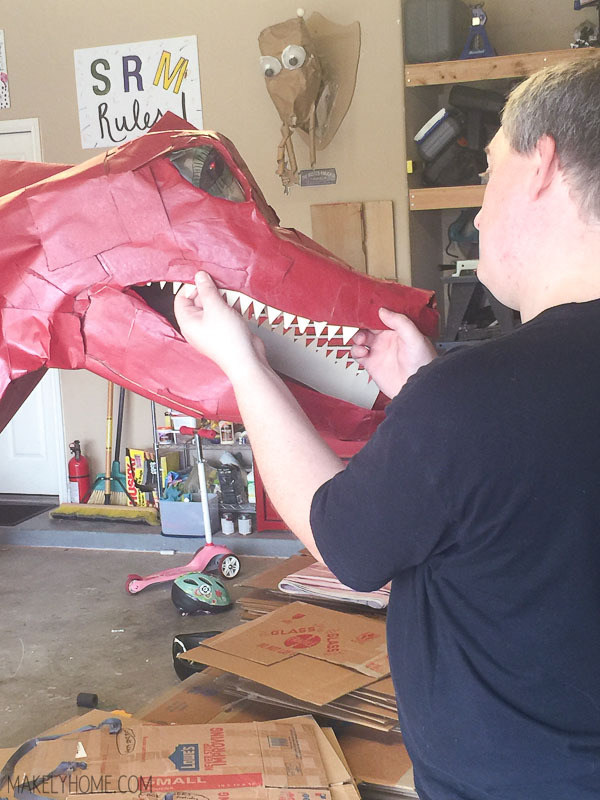 He used cardboard to build up sections of the skeleton and then covered it with brown paper. 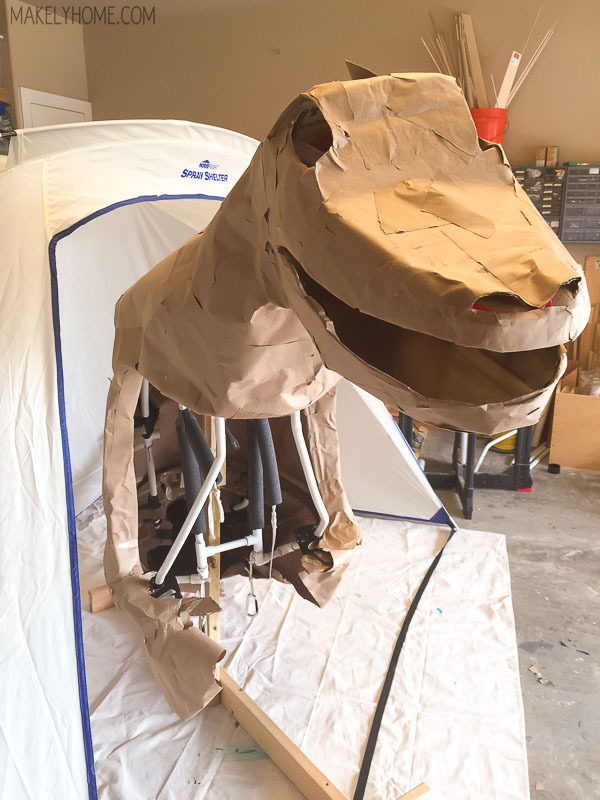 He used duct tape to tape the paper onto the skeleton, and then used spray glue to cover the tape with smaller pieces of brown paper. It ended up looking a little like papier-mâché, so it was a neat effect. He cut cardboard triangles out of old boxes and covered them with brown paper. 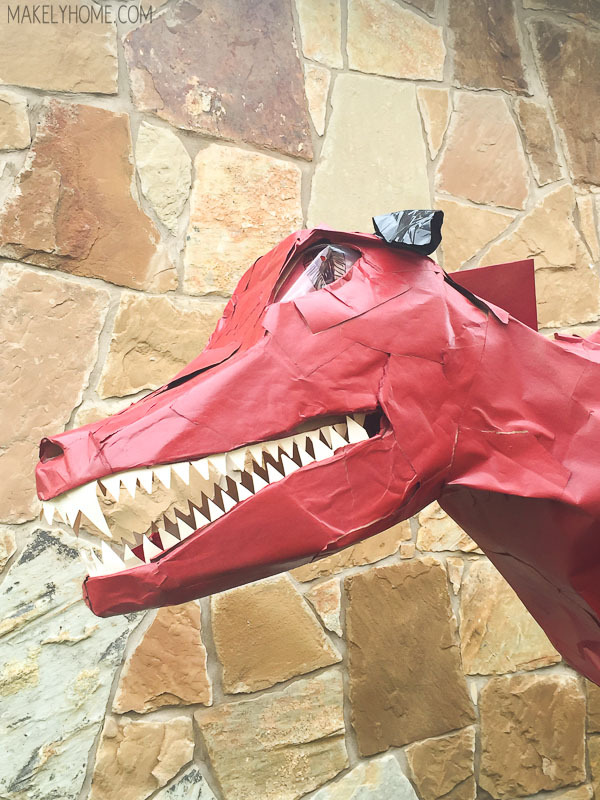 He also formed a head out of cardboard and covered it with paper. 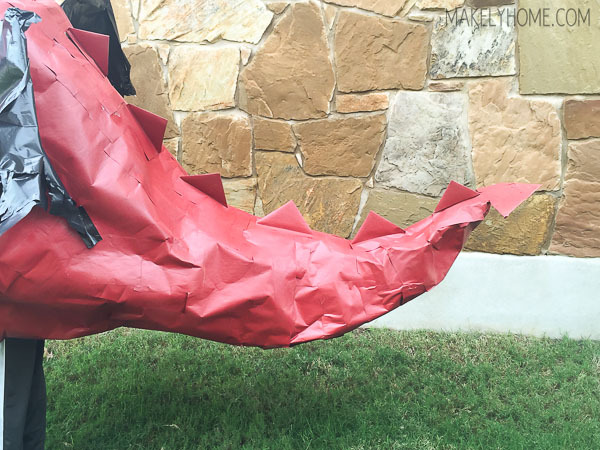 Then, it was my turn to take the costume reigns, as the dragon needed to be painted red (per Zack’s request). But, oops! He was far too large to fit into my HomeRight Spray Shelter (Amazon affiliate). This is actually not that big of a problem, though. 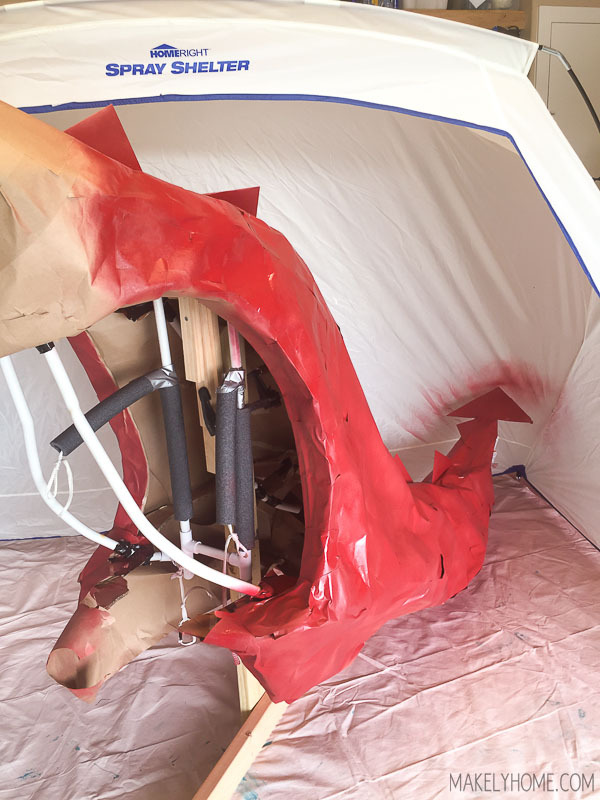 I basically just spray painted him in sections – only focusing on the parts of the costume that fit well inside of the Spray Shelter. Once that coat was dry, I flipped it over and painted the other side. I think I had to do 4 different sections of painting (back top, back bottom, front top and front bottom), but since I was painting paper, I only had to wait about 30 minutes between sections due to the quick dry time. After he was dry, Tom put the finishing touches on him. He drew eyes on clear sheet protectors and backed them with red sandwich baggies. He cut teeth out of manilla file folders so they wouldn’t be too glaringly white. He made wings out of wire hangers and black plastic trash bags. We love to use stuff that we already have around the house, so think outside of the box when you have details to add to a project like this. As you can tell from his little face, Zack absolutely loved the end result. It ended up weighing about 10 or 15 pounds, but he wore that thing proudly for a few hours. And because I want to poke the beast, here’s a shot of Zack and Emma together. I was in charge of her puppy costume. I just hot glued some stuff on an existing piece of clothing. It took me 15 minutes, and it’s adorable. Take that, Tom. 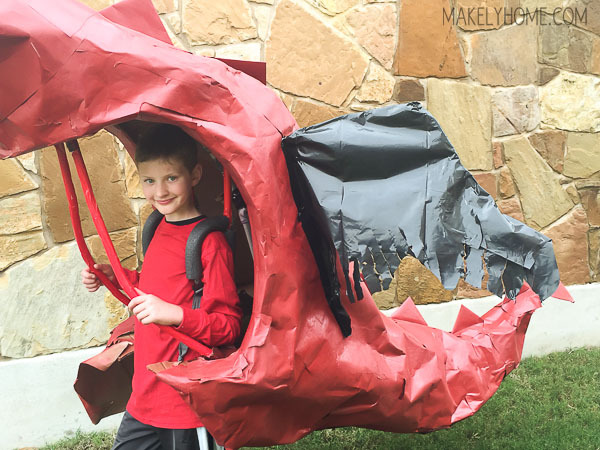 HomeRight is giving away one of their awesome Spray Shelters to one of my readers – now you can make your own Halloween costumes next year a la Tom. 😉 Simply fill out the Rafflecopter box below to be entered to win! As a HomeRight Ambassador, I have been compensated for this post. All opinions are my own. I would paint some thrifted kitchen chairs in my new shelter. I have an old chair I’ve been meaning to paint. I have a buffet waiting to be painted! I’ve got a raw piece of furniture that’s screaming for some color! 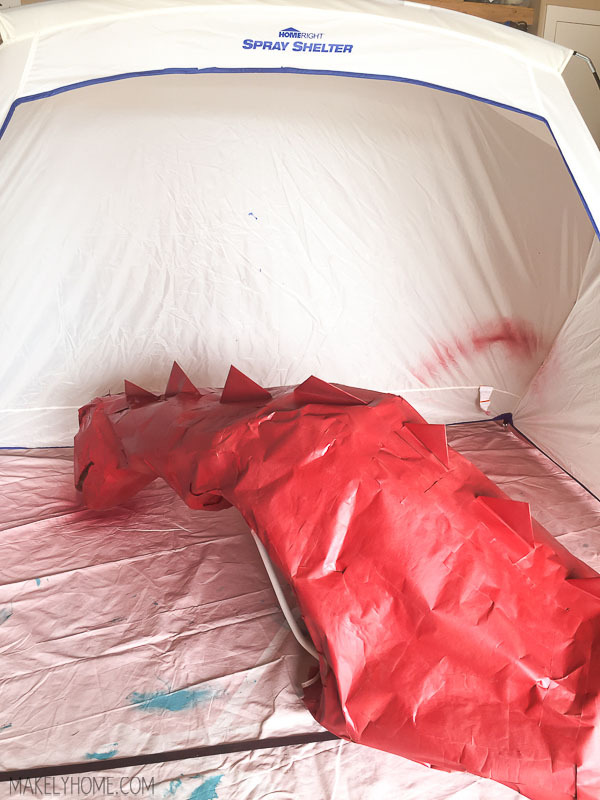 The paint shelter would protect everything from getting over spray on it. while thrifting I found an old toy chest for my grandson but there is a pool where I live & the landlord will not let me paint anything unless I can make sure there will be no over spray…..so this would be perfect. thank you for the chance. OMG…. you guys crack me up!!! That’s so awesome!!!!! What fun memories for your kids!! The first item to paint will be a bookcase. I have a chair, a nightstand, and a basket from the thrift store waiting to be painted. 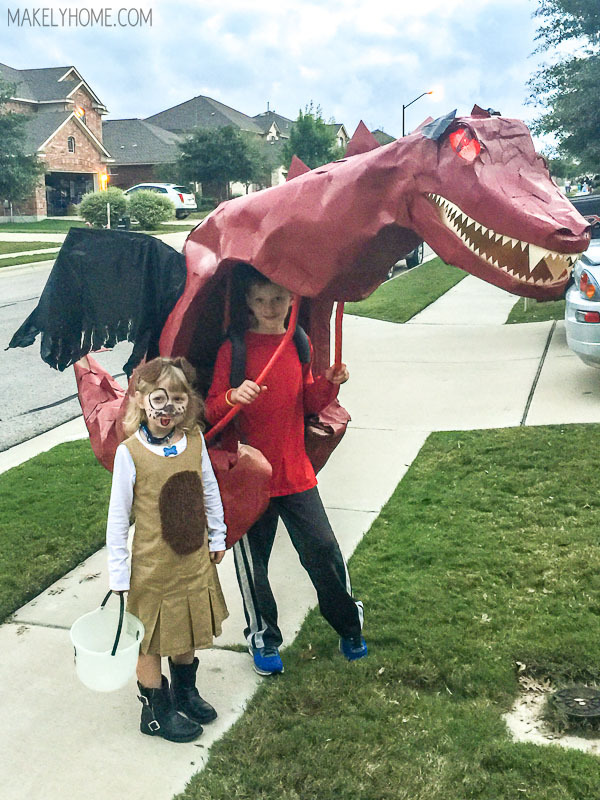 What an amazing Dinosaur Costume….love the little puppy too! True dedication there. 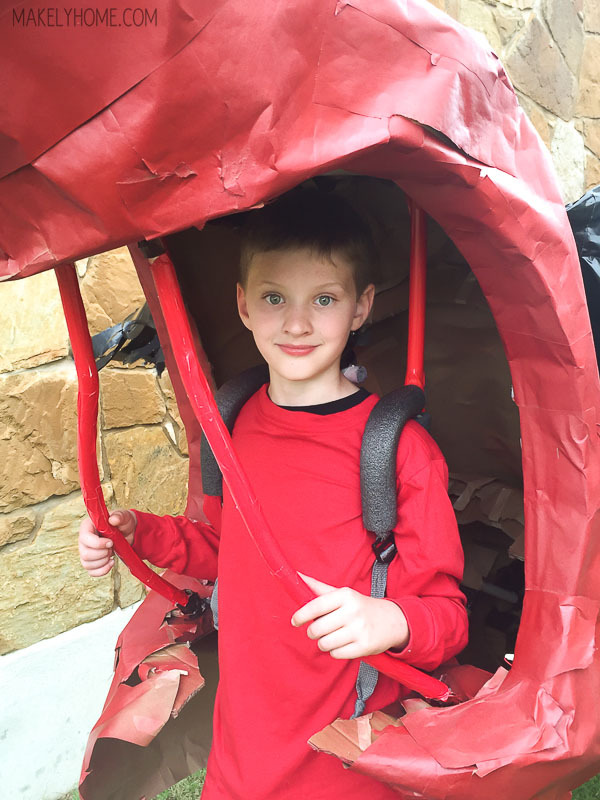 I remember last year my son wanted to be a Space Marine, so we made it out of foam, it took 4 months and I have scars from the glue gun also, but he loved it…..so much so that he wore it again this year….lucky for me since we were a little late figuring out what to be this year around. I love home made costumes.